Choosing an unaffiliated homestay | What can I do with a B.A. in Japanese Studies? Usually when you study abroad in Japan through your home institution as an undergrad, you get asked the big question: dorm or homestay? Most Japanese universities affiliated with sister institutions (for example, Gettysburg College is affiliated with Kansai Gaidai, and Temple University) have some kind of homestay option for you to experience life in Japan with a Japanese family. These families are given a stipend to take you into their homes and introduce you to Japanese culture and language, hopefully providing a more culturally rich and linguistically intensive experience during your stay. But if you aren’t affiliated with a college or university, how should you go about searching for somewhere to live? This was a question I asked myself when I decided to attend the Inter-University Center for Japanese Language Studies (IUC) in my second year of graduate school at Ohio State University. Though Ohio State has a number of affiliated programs with universities, the IUC is not an accredited institution, but a language training center, meaning that homestay was not an option. In fact, it is strongly discouraged by the Center; they want you to focus on research and language acquisition, not becoming accustomed to Japanese culture and lifestyle through a family that could potentially be distracting to your studies. Then why do unaffiliated homestay? 1) because I had had my fill of research-oriented Japanese learning. My reading and writing in historical scholarship were quite good, but my spoken and daily conversation in modern Japanese were shaky. It was weird and disappointing that I could read 12th century texts and scholarship on 16th century history, but I couldn’t understand everyday television shows and lacked vital modern vocabulary. 2) because I missed out on the chance in undergrad to do affiliated homestay, and I always, always regretted it. A semester in international dorms was fun, and it had its perks, but I was always sad that I missed perhaps my only chance to have a host family in a foreign country. 3) because financially, it made the most sense. While the IUC and other places may offer discounted housing, I had no savings and was only on a Foreign Language Area Studies summer fellowship, which meant I had a $2,500 stipend for the summer for travel expenses, food, rent, textbooks, etc. That is barely anything! The possibility of paying for key money, security deposit, food costs, furniture, kitchen supplies, and more out of pocket was simply not feasible. 4) because many homestays will offer to cook breakfast and dinner for you as a part of their rental fee. For a student who has very little money and who plans on focusing primarily on studying, this was a huge plus. If I could find a cheap homestay, I just might survive my time in Japan. Finding an unaffiliated homestay meant using everyone’s trusty friend: the internet. Now this didn’t take any special searching or digging. Honestly, I just typed ‘homestay Japan’ into Google and the first site that came up seemed to be the most trustworthy one I could navigate with the least amount of effort. I used http://www.homestayweb.com/, and I actually highly recommend it if you want to be in complete control of the homestay selection experience, because most of the other resources I list in our Life Abroad section have some sort of company or organization that acts as the go-between to negotiate your arrangement. If that’s what you’re looking for, of course, all the power to you (click here to go to a list of such sites). However, I wanted to make direct contact with the families and choose the right one for me, without the hassle of applications or service charges, and Homestayweb let me do that. 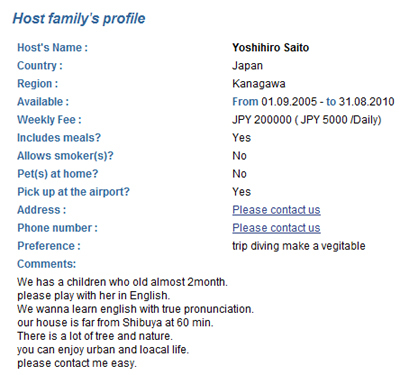 In addition to posting an advertisement on the message board area, I could search homestays by area (in my case, Kanagawa prefecture), and take a look at people who had put up their own profiles offering rooms in their homes to foreign students. I highly suggest you be proactive and email as many people as possible! It’s pretty self-explanatory. Note that these first three include photos, which is often not the case. When I emailed people I asked them for photos of themselves and their home and offered photos of myself as well. Take special note that these prices are weekly prices in yen, and you’re expected to pay as such! Some people don’t put up much information at all, and others are quite detailed. Of course, this in no way reflects the quality of your future homestay. Not every family has a good grasp of English. This goes without saying. Remember, Homestayweb is not responsible for any interactions with you and a potential homestay. There isn’t a filtering method as with many homestay services that interview the people you sign up with. In my experience, some people were single, looking to fill a room or have a guest to talk with. I remember one of the people I contacted ended up being a 20-something guy who wanted to rent out part of an apartment one of his male friends was the other occupant of. But most were families. You never know quite what you’re going to get, and if you’re contacting people from America, you can’t meet them ahead of time (though you probably could Skype!). If something sounded fishy when I read an email, I politely declined. Is this a homestay? Or a sharehouse/guesthouse? One thing I noticed was that here and there sharehouses/guesthouses (similar to hostels, places renting out multiple rooms to many foreigners) sometimes try to pass themselves off as homestays. Ask lots of specific questions about daily interaction, people within the house, if other homestay students will be there, etc. Some people genuinely want to have foreigners experience life with their family, others are just out for a profit. I had a friend in the summer program of the IUC who ended up in a sharehouse which was her and 6 random men (both Japanese and foreign). Talk about uncomfortable! Who is a good fit for me? What are they looking for? This sounds terribly stereotypical, but I’ve found a lot of the time it’s true. And if you don’t mind working in some English lessons here and there for the kids, it’s not much of a problem. There’s a good deal of people on this site with children ages 1-7. But my recommendation? Do not enter a house with children under 3 years old. Maybe this is my personal preference. Maybe you love babies! Regardless, this may mean that there is a child in the house that could be constantly crying and need attention, or that the host family has stricter than normal rules. When I had a homestay in Yokohama during the summer, there was a 2 year old in the house. This meant lots of crying, lots of distracted Mommy, and since the father was rarely home because of business, the mother wanted me home by 10pm every night or she’d lock me out. Since there were four layers of security between her and an intruder, and because I was a 23 year old graduate student, I was shocked that she felt that way, but being the guest in the house, I couldn’t complain. My host mother was also a housewife, and barely left the house. I never saw her with any other friends, and she even had all her food delivered to her door. Kind of strange, and something I couldn’t have anticipated complicating my stay. On the other hand, my second homestay during the academic year was a family of two working parents with children ages 4 and 6, and let me tell you, those kids were a blast! Just old enough to be outgoing and have a conversation with you, and be really interested in learning some entertaining English words. It was great fun being the big sister they wanted to play with all the time, and there was a lot more freedom in the house in general. The family wanted to go on vacations and have me spend time with them, but also respected that I was a student and an adult, so I was given a key to the house and asked to let them know my schedule and if I would be out late or past the last train. It was a fantastic experience and the homestay I had always wanted. Of course, every home is different, and depending on your own goals in doing homestay, a certain type of family might be right for you. Additionally, your goals might be best served by going through a service rather than somewhere completely independent like Homestayweb. My advice is: whatever you choose, investigate it thoroughly! That’s the only way to find a good fit and stay safe. I’ve gathered a lot of links for homestay and housing services, so be sure look at our “Life Abroad” tab, or just click here to check them out. 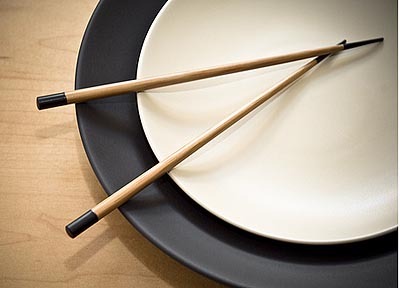 This entry was posted in culture, homestay, housing, living abroad, main posts and tagged culture, do it yourself, homestay, Japan, Japanese culture, living abroad, resources, unaffiliated homestay. Bookmark the permalink. It is a very wonderful site. It sincerely enjoyed it. The autumn tint introduces Japan very beautifully because of the autumn now though I also have the site of the herb. Please come to my site by all means. It is healed. It really can be disheartening. I had a male friend who was trying to find a homestay at the same time as me using the same site, and he found it quite difficult. In the end, though, he was able to find a couple of people willing to host him off of homestayweb.com. If the profile doesn’t specifically insist on females, try your luck. Or, in some cases, you might email them anyway and apologize but ask if they’re willing to change their minds (you never know!). I’m sure it depends on what kind of stay you’re looking for and who you are as well (a family would be much more understanding about a somewhat younger male student affiliated with a university or study program, as opposed to someone older just looking to travel, etc). That being said, men might have more luck going through a service than something completely independent like homestayweb. But it can be done! 🙂 Best of luck to you. Let me know if you have any other questions! why do they generally prefer females anyway? Do you have an idea? For some reason I can’t respond to your comment (not sure why there isn’t a reply button), so I’ll put it here. In a lot of cases, homestay families will prefer females because the father/husband is out of the house a lot, so they want to feel they can trust their wife and/or kids are safe while they’re out of the house. Plus, in general, they have an image of foreign women as more responsible than foreign men. This might not always be the case, but it’s what I’ve found to be the case a lot of the time. If it’s any consolation, my friend was a male, 28, attending the Inter-University Center for Japanese Language Studies (so yes, a language program, but no, not affiliated with a university) and he was still able to find something through independently contacting people via homestayweb. So depending on the area and the number of people you contact, I suppose, you may find yourself with something. 🙂 Good luck with the search! Let me know if you have anymore questions. Pingback: Oral Proficiency Interviews: What to Expect « What can I do with a B.A. in Japanese Studies? Pingback: IUC Series: Housing – Monthly Mansion vs. Apartment | What can I do with a B.A. in Japanese Studies? Pingback: IUC Series: The IUC Summer Program | What can I do with a B.A. in Japanese Studies? Pingback: IUC series (final! ): Former students – Where are they now? | What can I do with a B.A. in Japanese Studies? Thanks so much for all of the info. I’m off to IUC this summer and your website is filling in a lot of gaps for me. For graduate students that really want to focus on language acquisition, would you suggest a home-stay? On the face of it, it seems like a good way to avoid falling into only hanging out with IUC students and reverting to English, as well as having a built-in network of native speakers, but if people want home-stays to double as English teachers I worry that I might not end up speaking that much Japanese.. I know ultimately it would depend on the particular family, but if language practice is first priority, do you think home-stays are the better option? 1) If you’re just doing the summer program, there might not be that much time spent hanging out with your fellow classmates. I know in my summer term some people did, but because classes are never switched up, I think some people slipped on by doing their own thing with minimal hanging out. But that’s also completely a personality issue; my class happened to have a lot of shy people with their own goals in mind. 2) As a guy, it will be harder for you to find a homestay. Not that you can’t, but unfortunately the trend tends to be that families want younger female homestays. This is in part because oftentimes homestays are source of secondary income for stay at home wives or a way for them to socialize, and with husbands working, they don’t feel comfortable by themselves or just them and their kids with a strange foreign male in the house. Whether or not they have expectations of you as a homestay student to work on English with them is a separate matter you’d have to discuss with them. So, yes, I do suggest homestay, but remember that the IUC doesn’t sanction it and you may have trouble securing one. That being said, don’t forget that you can also foster local connections with people and practice in a number of other ways that simply revolve around being social in your local neighborhood. A lot of people I know made great contacts and got a lot of practice in by frequenting a favorite restaurant or bar. Just an idea! Thank you for all of this useful information! I posted an advertisement on Homestay Web and am in communication with three different families right now. Now that the questionnaire involving housing has been released by IUC, I’m thoroughly convinced that I should do a homestay, mainly for the experience (I experienced it for a semester while in KCJS) and financial reasons. Would you mind sharing some logistical details about the approximate cost for staying with the second host family? Also, how long of a commute did you have every day? They all seem very nice, but I’m worried about close to or minimum hour-long commutes. Hi there! 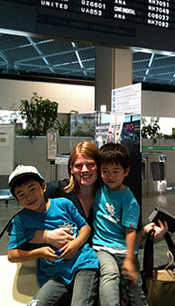 Hope a homestay works out for you. My homestay family was very kind and did not charge much for rent. I believe my first family charged 85000 (but were practically in Minato Mirai, so it was more expensive, and two meals were included) and my second family charged 60000 (with two meals included). With the second family I had a commute of about 30 minutes train ride plus 15 minutes walk from Sakuragicho station. I don’t remember if I did 3 month or 6 month teiki card plans, but whatever I did was about 15000 yen. I think 30 to 40 minutes is a reasonable commute– just bring your flash cards or some other study reading for the train! I know some people lived in apartments as much as an hour and a half away, but that’s very much a personal decision. Hope this info helps! Pingback: Teaching English Informally in Japan | What can I do with a B.A. in Japanese Studies?